Yes it’s true. 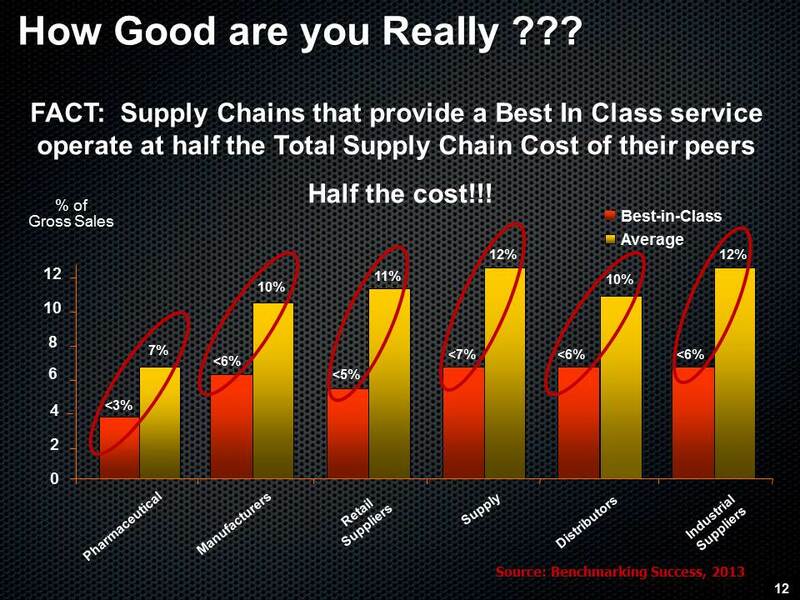 You can provide ‘Best in Class’ customer service and yet operate at half the Supply Chain cost of your competitors! How can that be you ask? Like you, I learnt that as customer service increases, so Supply Chain costs increase too. And to a point around 97% customer service, that costs increase exponentially. Remember that lesson at University? Well it’s wrong! And here’s why. A few years ago, we decided to look at our Supply Chain Benchmarking database, to see what the ‘Best in Class’ performers in terms of Service, were performing like in terms of Cost. And we got a shock. Because the best in class service companies were operating at a much lower supply chain cost. In fact about half the cost of the average company. OK we thought, maybe this is industry specific? So we conducted the same analysis on 6 key industry sectors. Guess what? Same result! I often share these results with guests at conferences and seminars, and ask them how this could happen. And I explain with some case studies. If you focus on outstanding service, you look for ways to improve your processes. That focus helps you identify inefficiency and waste. You then become more efficient. Your reduced waste in terms of back orders, handling complaints and the like, reduces cost. Quite simply, what you focus on gets fixed. And here’s the really great secondary benefit. Because your service is so good, customers buy more and you win customers from your competitors. So your sales increase. In fact your service is so good, often you can increase prices. And so the gap widens even more between you and your competitors…. So what’s your customer service like ?